Daffodils (Narcissus spp. ): growing, planting, caring. Their early bloom is why we love them ! Scientific name : Narcissus spp. Narcissus - daffodils - is a genus of spring perennial plants of the Amaryllidaceae family. They are perennial herbaceous bulbiferous geophytes, that die back after flowering to an underground storage bulb, bearing conspicuous flowers with six petal-like tepals surmounted by a cup- or trumpet-shaped corona. The flowers are generally white or yellow, but also orange or pink in garden cultivars, with either uniform or contrasting colored tepals and corona. Narcissi are bulb plants whose beauty is very much appreciated in gardens. There are many species and a multitude of horticultural varieties. They are characterized by their basal leaves and hollow stems, carrying one to several flowers. The flowers have six petaloid tepals. The stamens, six in number, are inserted into a crown or paracorolle in section or trumpet. The fruit is a trilobed capsule usually containing many seeds. 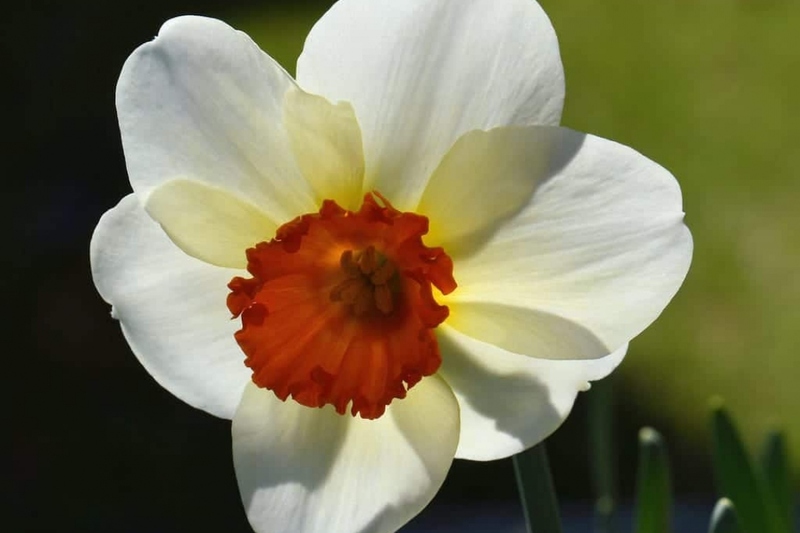 The real daffodil is Narcissus jonquilla. However, another species is also called "Daffodil": it is the yellow narcissus (Narcissus pseudonarcissus). You can plant all the spring bulbs - and so narcissi and daffodils! - inside or outside. Outside, most often in the fall, dig deep, remove all weeds and pebbles and add some peat and sand to the soil. Then wait if possible a few days before planting: you can at this time hoe slightly to remove the weeds that have taken advantage of the opportunity! The depth of the hole depends on the size of the bulb you want to plant. In all cases, the depth must be equal to two and a half times their height. Help yourself with a bulbs planter, it is graduated and therefore very practical: push it into the ground to the desired depth, remove it (he takes the earth with him). Then put the bulb at the bottom of the hole, point up. You can put a small layer of sand at the bottom of the hole so that your bulbous plant always has dry feet, and at the same time do not risk leaving a pocket of air that would accumulate water. Finally, cover with earth, by removing the planter which releases thus the ground which it had carried away. Finish with a good watering. Indoors, in pots or in a planter, plant the bulbs tight against each other to obtain a mass effect Water regularly for a few weeks. It may sometimes be necessary, when vegetation is restored and during flowering, to water daffodils, and also in case of small droughts. Stop watering after the flowering. For bulbs in pots and indoors, water regularly, as soon as the substrate is dry. The presence of a light layer of mulch over a draining soil will limit both evaporation and much of the need for watering. Mulch in November and renew if necessary in April-May. 3-4 cm of mulch will be enough. You can, if you are very brave and patient, sow the botanical species under a cold frame. After germination, keep the pots free from frost, keeping the soil moist. You will need to keep them 2 years in sheltered before being able to transfer them to the garden. Note that the first flowering can take up to 7 years. Better to plant bulbs from tuft division. You can cut the stalks once they have faded, but wait until they have dried naturally: this is when the bulb regains strength to face the winter - and start again the next spring! You can easily divide the tufts of narcissus, well after flowering, in June or so in September. Separate the bulbs by hand, and give your neighbors and friends extra bulbs! Repot every 3 years in June or September, to divide, and to renew the substrates of your daffodils. Separate the bulbs by hand, and replant in a new substrate. Remember to water for a few weeks! If your daffodils do not really like where they are, they can develop crown rot. Watch from time to time, and move them as needed.